Bursting with flavor (Cinnamon! Maple syrup! ), this delicious take on a winter standard is also gluten free, vegetarian, and packed with fiber. Slice trimmed Brussels sprouts in half. In a medium bowl, combine halved Brussels sprouts, 2 tablespoons of olive oil and salt to taste; toss to combine. Place on foil-lined baking sheet, cut side down, and roast for about 20-25 minutes. During the last 5-10 minutes of roasting, turn them over for even browning. The cut sides should be partially charred but not blackened. In a medium bowl, combine cubed butternut squash (peeled and seeded), 1 tablespoon of olive oil, maple syrup, and cinnamon; toss to mix. Place butternut squash in a single layer on the baking sheet. Bake for 20-25 minutes, turning once half-way through baking, until soft. Note: You can roast the Brussels sprouts and butternut squash on 2 separate baking sheets at the same time. (Optional) – For more sweetness, add 2 to 4 tablespoons of maple syrup. Do not add all the maple syrup at once; instead, start with 2 tablespoons, then add more as desired. Toss to combine. 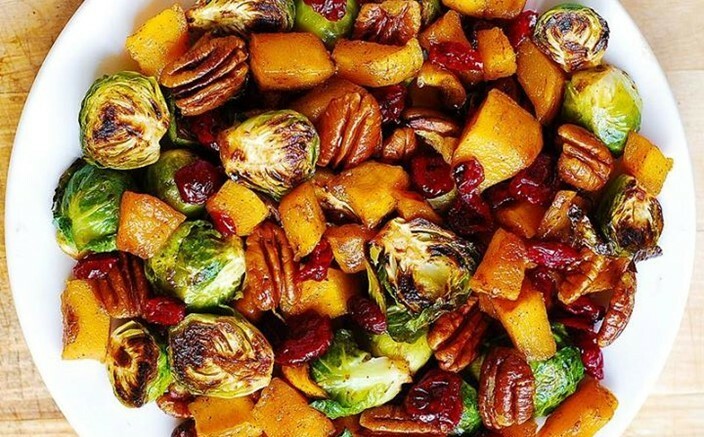 Be the first to comment on "Roasted Brussels Sprouts, Cinnamon Butternut Squash, Pecans, and Cranberries – Recipe"